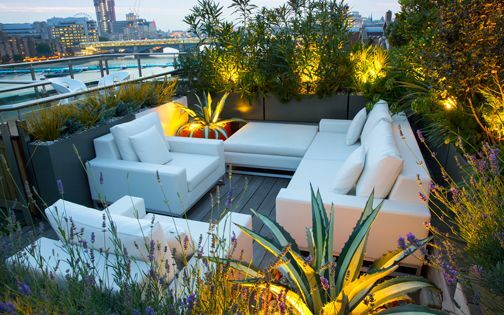 This Clerkenwell roof terrace is nestled above one of the busiest junctions in Central London; the crossroads below is utterly devoid of trees or greeneries of any kind, while wildlife is scarce, and the area highly polluted. 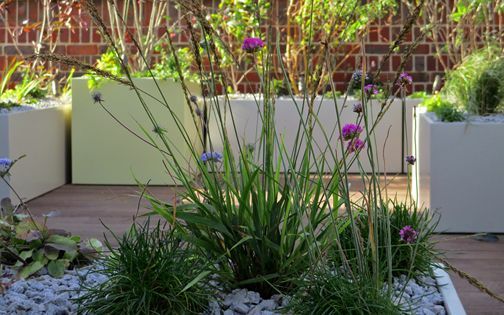 We sought a way to integrate a contemporary design, in keeping with the apartment and its surrounding architecture, while utilising a wildlife friendly planting scheme. The clients endorsed this approach, and were enthusiastic about its prospects. We created an intimate, natural space, which fuses architectural design with care for the environment, and as the layout features three outdoor spaces on various levels, there was ample scope for biodiverse cultivation. The crossroads of Old Street, Clerkenwell and Goswell Roads forms a busy and conspicuously treeless Central London junction. Habitat loss and pesticide use in both town and country alike is causing a decline in bee, bird and butterfly communities. Although official statistics for insectan pollinators are rising encouragingly in London, their data is principally augmented by unsustainable bee populations cultivated across commercial roofs which cannot provide diversified resources. 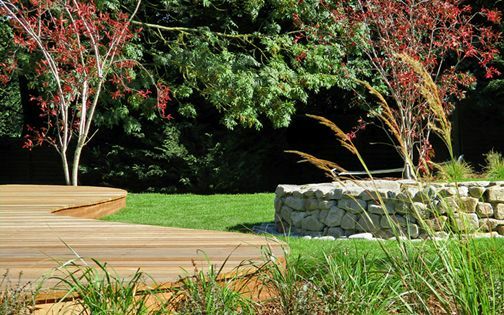 Our clients take a naturalistic approach – a mindset they follow in their country garden outside London. 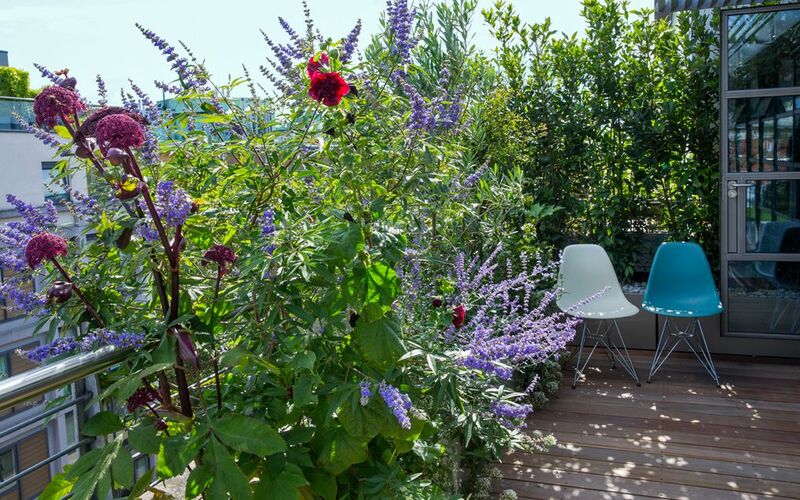 Indeed, every one of us who tends to a landscape, be it an urban roof terrace, balcony, patio or courtyard, can contribute by including flora which sustains wildlife vital to our ecosystem. 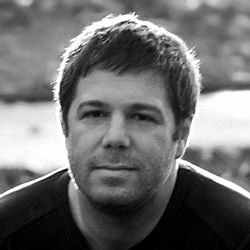 This comprehensive, all-embracing practice extends the flowering season, and infuses edible elements to soften architectural roof structures. The ‘Ice Crystal’ Fig is part of the edible collection on the upper terrace, where both its owners and visiting wildlife enjoy a delicious shared crop! Round pot groupings, in light-toned turquoise, soften our bespoke powder-coated troughs, adding a touch of colour and contrast with tactile Lavenders. A Laurel hedge provides shelter for birds, along berries produced by Cotoneaster, Crataegus, Euonymus, Olea, Rhamnus and Viburnum, where this wild, broad palette of native garden plants, interspersed with Mediterranean flora, generates evergreen outlines in warm sunshine. 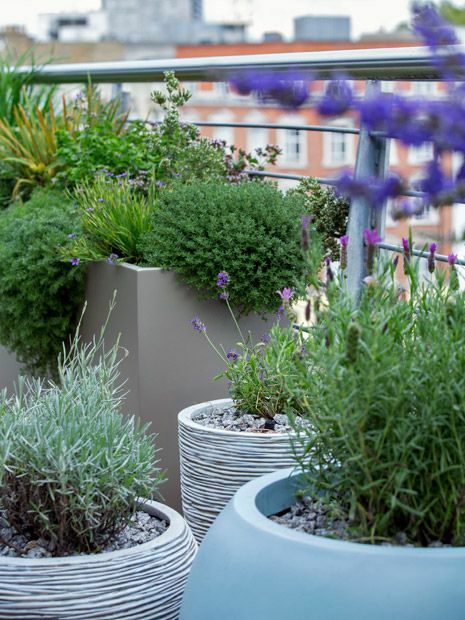 Our tall slim troughs ease movement across the long roof terrace space, enhancing usability; by elevating the planters to a metre in height, the herbs are easier to pick and appreciate closely. In late summer, the Alder Buckthorn, Rhamnus frangula ‘Asplenifolia’, is enveloped by an enchanting duo of Buddleja davidii ‘Empire Blue’ and Echinacea purpurea. 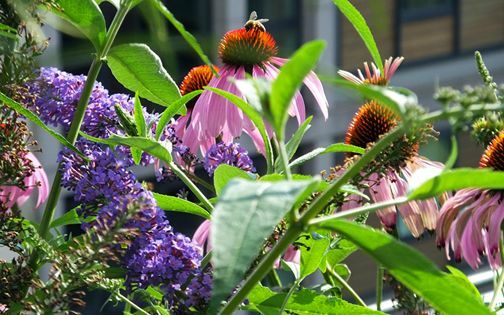 The blue Buddleja attracts butterflies, while the Echinacea's bright and plentiful coneflowers form a summer bee magnet. 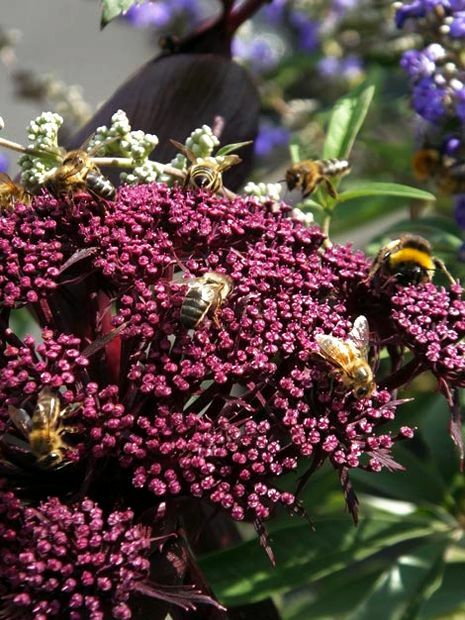 The medicinal Angelica gigas, although a non-native biennial from China, provides much nectar for hundreds of bumble and honey bees which began frequenting the roof garden promptly. Each terrace section produces further food for visiting wildlife, while alpines and herbs along the seating area extend the flowering season from April till November. The insects indulge in abundant nectar of countless natives and continental species such as Achillea, Alcea, Centranthus, Digitalis, Dipsacus, Erysimum, Lavandula, Lavatera, Lonicera, Papaver, Perovskia, Pimpinella, Salvia and Vitex. While the main terrace contains culinary herbs, the upper rooftop is allocated to the production of edibles and birdlife. 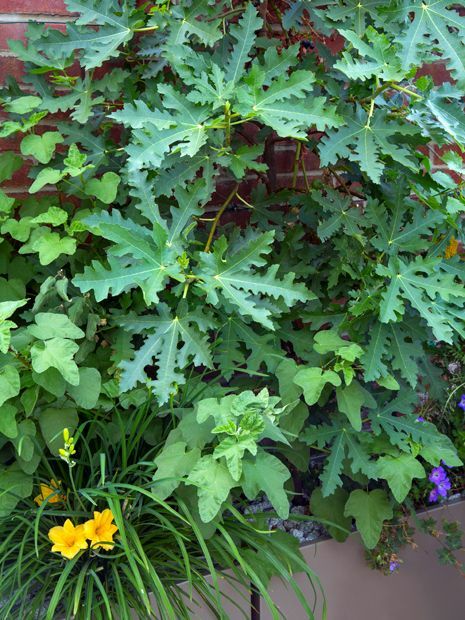 Grapes, Figs and Apple espaliers are trained up the warm brick walls, while a potted Lemon tree accompanies a Rhubarb trough. 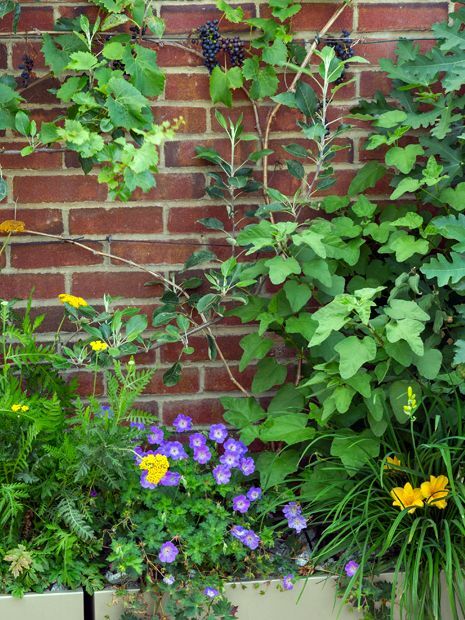 The ‘Regent’ grape is enriched with Daylilies, enveloped by Yarrow, Mallow and Salvia. We all love culinary herbs, even if sometimes we forget they're there, yet our friendly buzzers are gradually deprived from steady supplies of nectar – where would we be without sufficient insect pollination? 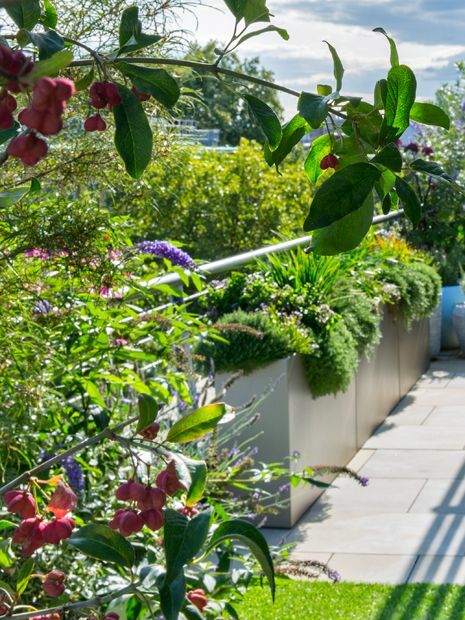 In this wildlife roof garden, plentiful, energising herbal clusters are relished in home cooking, amid a contemporary, sustainable terrace setting. Soothing Chamomile and effervescent Thyme ramble among miniature alpines and Winter savory, where in such a sunny terrace, the vigorous flora exhibits instant growth, and bees soon arrive – animating the urban scene with an unmistakable buzz. Teasels enhance the garden in late summer with their architectural silhouettes, reaching three metres in height. Although a biennial, as the Angelica and Digitalis, it's a worthwhile selection. From a tiny pot planted in early spring emerges a stately charismatic stem, producing beautiful conical flower heads lasting well into winter, which the bees absolutely love. 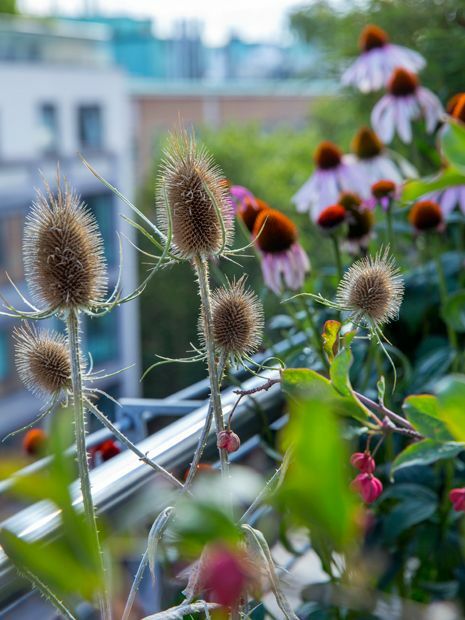 In the centre of Clerkenwell, our summertime season revitalises this city turning with a sprawling drift of Purple Echinacea coneflowers, appreciated skywardly across the streetscape below. The menu in this wildlife garden is served a la carte throughout the year, and if you possess tentacles, wings, a beak or tail, your dietary prospects keep getting better. We sought to include as many varieties of fruit as possible, and the spatial topography, spread across three terraces, provided a range of microclimates. This approach produced shelter, diversity and engagement for creatures of varied provenance. 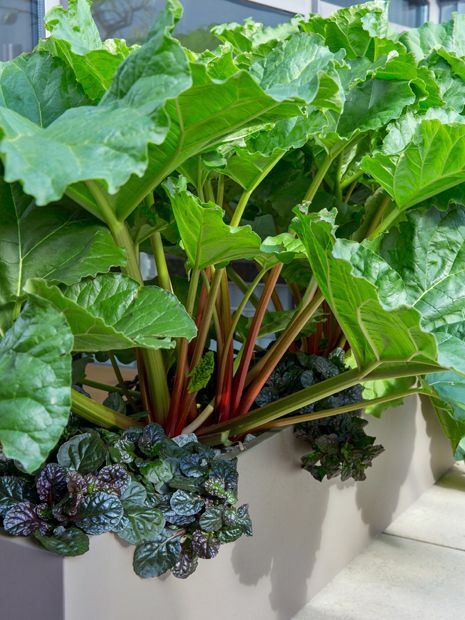 From Rhubarb to Figs, Daylilies to Lemon, Grapes, Apples, Rosemary and Olives, there's plenty for us land mammals and our airborne friends; do try this at home – you simply must! 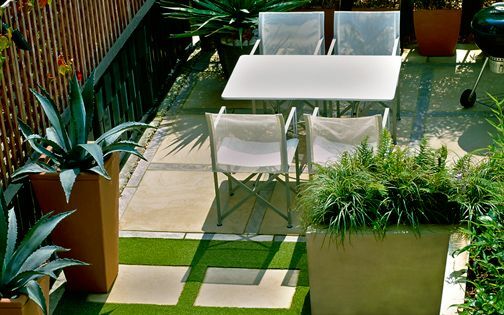 The elongated terrace was reshaped into three distinct garden zones, where natural materials merge with low upkeep artificial grass. 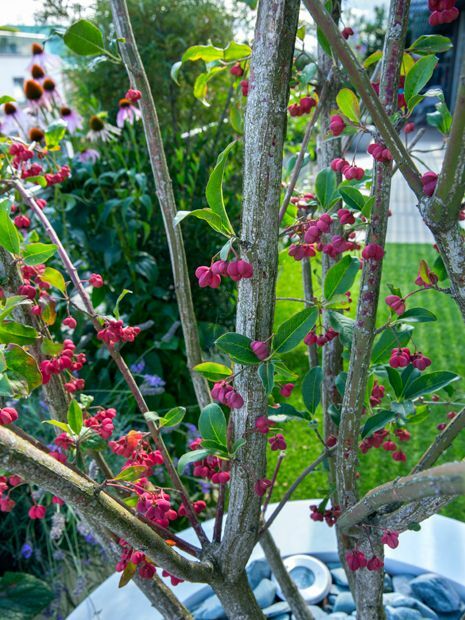 The city view is framed by a graceful native Spindle tree which enhances perspective as a sculptural focal point, while its multi-stemmed form withstands wind, producing remarkable autumn colour and beautiful scarlet berries which are highly appetising to birds. 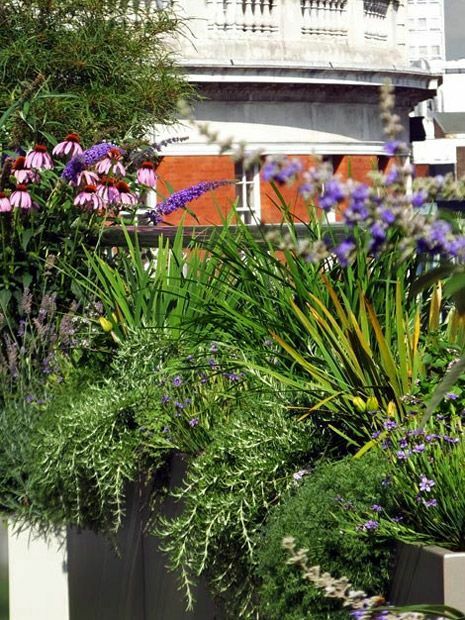 The Spindle is featured in a contemporary circular white planter, yet allowed to grow wild and blend into the sprawling nature of its surrounding flora – highlighting both the garden's seasonal transformation and our clients' bold roof terrace makeover project. The Spindle is one of our most wildlife friendly trees, producing architectural beauty, autumnal glory and vital berries for birds. Fast-growing, reliable and resilient, Euonymus europaeus ‘Red Cascade’ is a first-rate selection, and we love planting it where suitable; under the feverish Clerkenwell sky, its berries glisten towards the Barbican terraces with an invigorating scarlet aura. The unusual stems contrast our circular white planter, highlighted by a drift of Lavender ‘Grosso’. By combining evergreen shrubs and deciduous architectural trees, we created a diverse, natural backdrop for cultivating floras which extend seasonal interest, where intricate foliage groupings sustain dynamic species interplay, generating essential energy even on the dullest day. 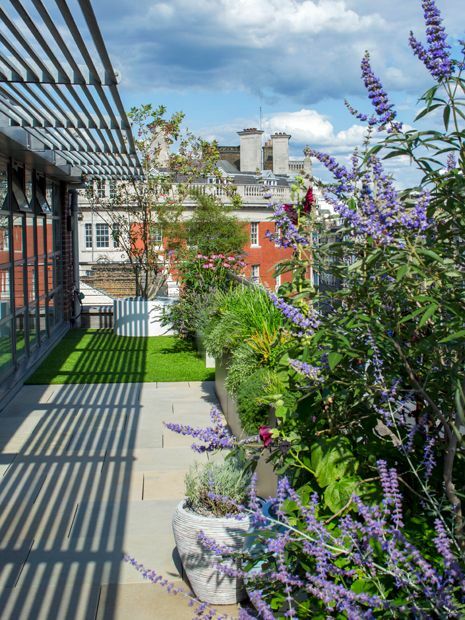 Within this private London home, frequented sporadically, wildlife is often left undisturbed, and while many roof terrace designs display sleek, organised feats of modern architecture, here, the character is intrinsically organic. The season starts in early spring, when alpine blossoms emerge, lasting long into autumn, while the native Spindle's breathtaking serotinal afterglow, alongside Butterfly bushes' heady fragrance, signifies a well-earned fruit harvest. 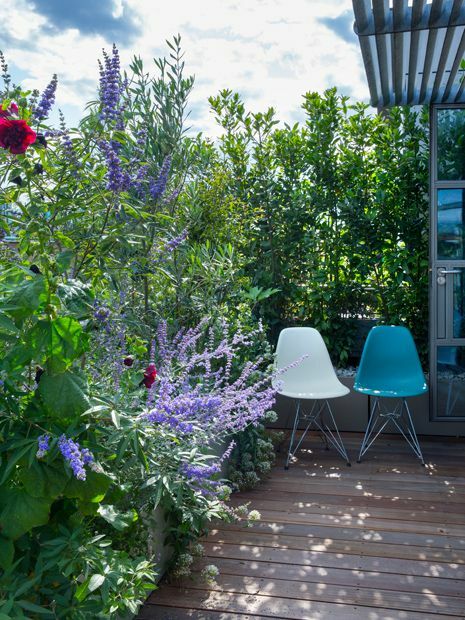 The scheme establishes a forward-looking sustainable mindset, in which environmental care for wildlife is integrated into a roof terrace garden in the very centre of London. 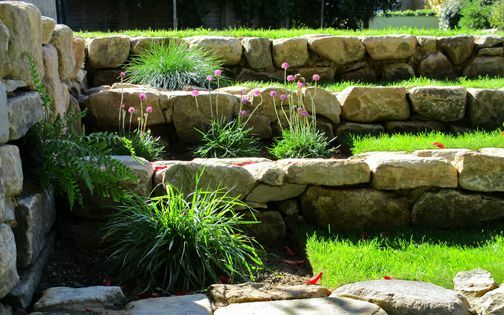 Land development is inevitable, albeit necessary, yet with its extensive, resultant habitat and species loss, it seems undeniably logical, and responsible, to adjust terrace design ideas to accommodate a bit of terrain for insects and birds. 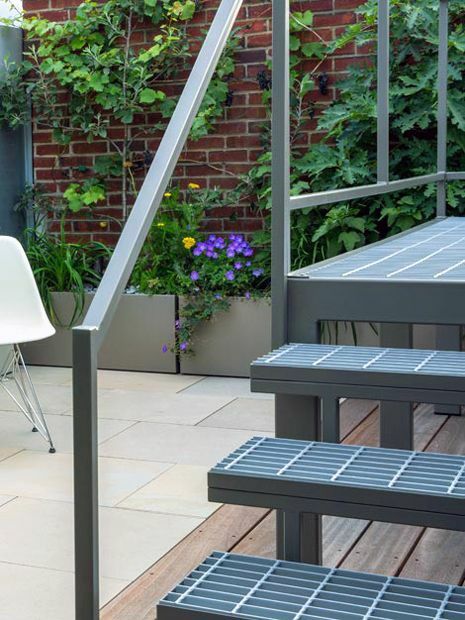 Contemporary roof terraces and back gardens shouldn't remain static architectural statements, and evolve into more natural, diversified, wildlife friendly environments. Seasonal interest can be extended by including native species to create balanced, nurturing and thoughtful landscape design schemes – securing a much-needed greener future.